A great brand doesn’t start with a product. It doesn’t start with a business plan. Every big idea, every legendary brand, begins as a story. The story is sometimes deeply entwined with the personal story of the founder/owner, but the brand’s story is a distinctive story all in itself. If you don’t know the story, if you haven’t spent time thinking about it and working it into a narrative that explains what makes the heart of your business beat, then you really don’t understand your business at all. Good marketing will bring people to your product or service, hopefully in sufficient numbers to keep the doors open. But marketing alone will not keep them coming back. It won’t create a bond between you and them. Solid branding will. Branding animates your product, your company, your employees, and your clients or customers. When branding is strong and a company consistently focuses on the values that their story embodies, their products or services can become part of people’s lives. In the best cases, those companies can actually influence the culture of an entire business sector and beyond. Author and social researcher Brene Brown says that “maybe stories are just data with a soul”. Businesses are driven by data, and the collection and analysis of ever-increasing amounts of data has become a huge part of any business. But without branding, without a compelling story, how do you even know what data is going to be most valuable to your business? How will you focus your marketing if you can’t articulate what’s important to your business? How will you convey the soul of your brand? With a story that gathers the threads of core values, uniqueness, and style your brand will show that it understands both itself and its customers or clients. Core values are important to your brand and they help drive your story. Core values are the DNA and foundation of your business. Other things about your business change with conditions and markets and data, but your core values do not. They dictate how you will conduct business and react to change, but they don’t keep you from evolving. Core values are important to define and for those within the company to understand, but they are not always explicitly stated. Instead they are frequently demonstrated by the company’s product, service, innovation, etc. But the stories the company tells about itself — about its workers, about its way of doing business — help to define these values in the minds of clients and customers. Some companies will have core values that customers are willing to pay higher prices to support. At other times their values will be simple and straightforward because their business is that way. For example, customers look to a bank to be dependable and keep their money safe, not to be especially innovative. Key to the importance of core values is that customers and clients will look to see themselves reflected in the values of companies whose products they use. If,customers see themselves as dependable providers for their families they will respond to products and services that reflect a belief in dependability and security. Your unique selling proposition is something you want to identify within your brand. What differentiates your product or service from those that have gone before? Why is your business worthier of your customers’ money than your competitors? He goes on to say that companies and their brands need to decide what they are going to be known for. Being too general, trying to be good at everything, leaves a company without a competitive advantage in this area. Put another way, a unique selling proposition defines your brand’s niche. In simple terms, when you decide to offer low prices, you will not offer other services that would raise prices. When you decide to offer the highest quality, you will not compete on price because that’s not possible based on your selling proposition niche. If you are operating in a crowded market or have a product or service that is difficult to differentiate, your brand provides the key to the niche that you alone can occupy. Your brand has a style. Identify it and align it with your story. The style can be visual, as in a logo, or a concept such as “relaxed” or “flexible”. It may be certain colors or a signature theme song, or a certain way of communicating. 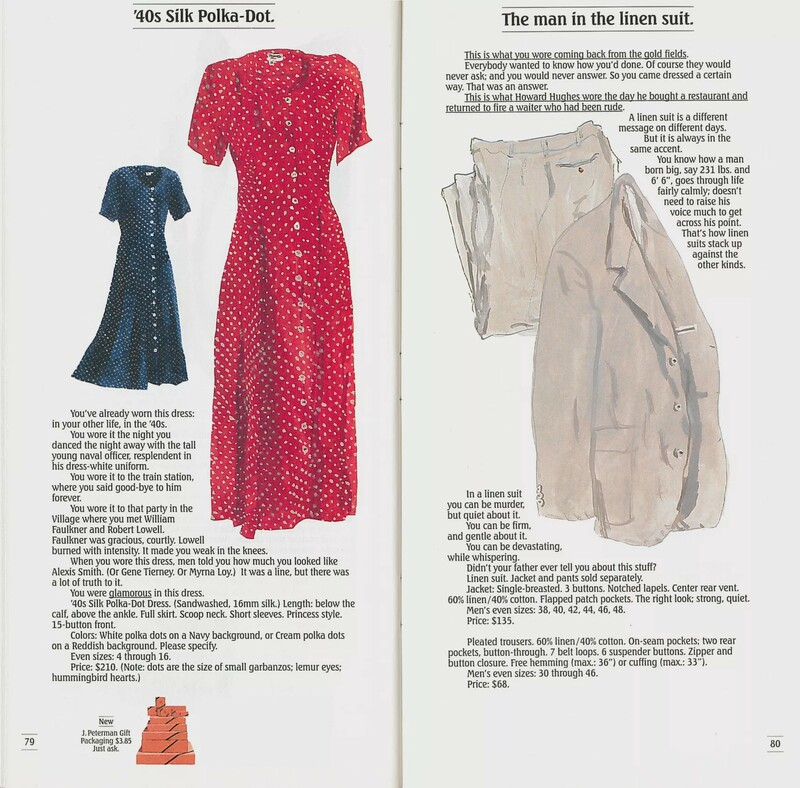 Consider the visual and written style of the J. Peterman Company’s catalog. Their catalogs differed profoundly from others being printed in 1987. They used long copy that didn’t merely describe the article of clothing they were selling, it told a story about it. And instead of color photographs, the catalog utilized simple but artistic line drawings of the clothes. That’s a core value that directs the company’s story and expresses itself in the uniqueness and style of its products as well as its presentation. That is a brand. The story is the central element in the J Peterman brand. The company’s website still uses drawings, now with color added, and photographs, which are necessary to sell products online. Although the more florid descriptions have given way to a more practical product description online, the site contains a blog entitled ‘Peterman’s Eye” which covers all manner of topics under subjects like Americana, Curiosities, Adventure, and Travel. So yes, they’ve evolved in their look and feel, but the story is the same. Branding and marketing are ritualized forms of storytelling that form an epic saga about a company and their products or services. This constant need to continue telling the story is one reason that the need for so many content providers has evolved. Writers, content marketers, SEO specialists, social media marketers and influencers, and even customers all participate in the storytelling, compelled and guided by their understanding, both explicit and subconscious, of the brand’s core values, uniqueness, and style. Marshall Bowden is a freelance blog and social media writer for hire who lives in Chicago. He tells stories about innovative music at New Directions in Music and investigates mindfulness and our inner worlds at Eat a Tangerine.Follow him at Twitter.